More specifically, Philip was originally an Economist who then early in his career achieved an MSc in Organization Development. He initially worked in HR and the related fields but his interests lie in real world research and its application to managing complex change. 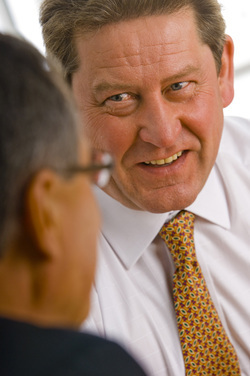 In his early career he lectured at several Business Schools, including Sheffield Hallam University, Edinburgh Napier University and Heriot Watt University and chose to focus on a consulting career built on bringing about complex change in organizations experiencing threats to their competitive edge and their future. Most of his work started off with the top team and undertaking ‘hands on’ research into organizational cultures and working processes. He uses a combination of 1:1 interviews, Focus Groups, Questionnaires and delivers honest, truthful , constructive and sometimes painful feedback ’face to face’. Philip works closely with the client, sponsor and management teams to devise a strategies for implementing improvements and overcoming barriers to change. He is viewed as an implementer as well as an architect of Change and has a total bias for taking action. Design and delivery of Lean culture change including training staff to become certified Trainers delivering Lean Business Transformation. Working closely with clients to develop a strong Leadership culture and install that culture through designing and delivering learning materials and facilitating the introduction of the desired Leadership process. Philip has post graduate qualifications in Coaching and Mentoring, Organisational Development, Lean Six Sigma, and Business & Management Education. He is also a Corporate Member of the Chartered Institute of Personnel Development. He is qualified and certified to use the majority of Ability, Psychometrics and Personality profiling systems which he uses on many organizational change projects. He is also a Master Black Belt Coach in Lean Six Sigma and has designed, written and perfected his own 'on-line' learning management system which enables him to coach Managers in Yellow, Green and Black Belt in Lean Business Transformation. He has carefully blended his knowledge of the applied behavioural sciences together with the best of Lean Six Sigma, to develop a more flexible and human approach to installing Business Transformation into service led organisations in both the private and not for profit sector. Philip has written 7 books on his experiences on ‘change management projects’ and is the author of over 300 Journal articles. He is also the author of many White Papers and Research Reports for a number of Corporate Clients, as well as designing prototype learning strategies for specific Corporate Events and Conferences. Every organisation has a different story to tell. All differ in their history, their structure, the technology employed, critical incidents in their development of both their ‘runaway successes’ and their crises and low points, as well as leadership, culture and working style. Because of this wide variation in organisational history and culture the strategic solutions have to be tailored specifically to take account of their past and shape their future. Every organization has its own unique fabric or culture. Philip focuses on the dynamics of the culture in order to design and deliver solutions to best prevent problems arising and remove barriers to change. His focus is on ‘winning acceptance to change’ and that is best achieved by understanding and overcoming resistance and organisational inertia. His tailored approach rejects the ‘quick fix’ and ‘off the shelf solutions’. Instead he works with his clients in a ‘hands on’ manner to confront the real issues inhibiting progress and improvement to install a better way that delivers tangible results. If you cannot measure improvement and progress, you are focusing on the wrong things. 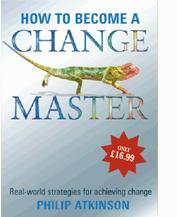 Effective change has to be based on specific behaviours, because until behaviour changes, nothing changes. Philip’s view on the best way to achieve tangible and measurable progress is to create internal capability inside the organisation – preferably in line management, to support and sustain the change long after it has been introduced. He favours tailoring any ‘change work’ specifically to the needs of the client bearing in mind the challenges to be faced in the coming years. If you would like to find out more about his working style, his projects and his views on Change why not email him direct or use the contact form. A short meeting could be the start to resolving those challenges that are getting in your way, right now.